Italian nobility meets legendary Murano artistry in the Fascino Murano Collection. Walk around Rome and you’ll discover the Barberini bee virtually everywhere–– carved into marble and wood, woven into curtains and ingrained in the architecture of every square in Rome. The bee, a symbol of hard work, dedication, and eloquence, comprises the crest of the powerful Barberini family, and the Barberini are to Rome what the Medici family are to Florence. In the Fascino Murano Collection, hand-blown Murano is topped with intricately-detailed bees for a charming tribute to the art of Rome. 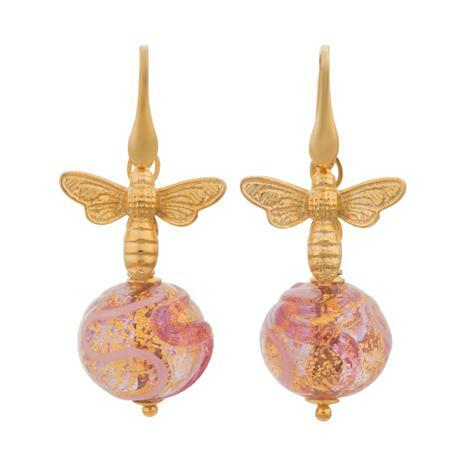 The creator of this stunning collection mirrors the hard work, dedication and eloquence of the Barberini bees in her craftsmanship. Here, Manuela Zanvettori has transformed glass into art, working solely with original Murano glass canes produced on the island. Choose from lush green Verde or glowing pink Rosa with flecks of gold. Gold-finished mesh settings keep things fresh and modern. This is how you create a buzz...Italian style.